Want Cheap Solar Cells? Paint Your Own Perovskite Solar Cell!! Don’t go running to your local toy store just yet to buy that paint-by-numbers DIY solar cell kit, but it — or something like it — could be on the market some day in the sparkling green future. The US Department of Energy is pitching low cost perovskite solar cells that anyone can make, with the right materials and a cheap paint brush. The Energy Department’s latest pitch for perovskite solar cells came out just yesterday, in the form of a long article on the website of the National Renewable Energy Laboratory. The timing and placement is interesting in terms of publicity. That’s because earlier this week the Energy Department’s main page featured a shout-out of support for the notoriously expensive Vogtle nuclear power plant in Georgia. In 2008, estimates put the cost of the Vogtle project at $10.4 billion. By 2017, the estimate had ballooned to $15.7 billion. The latest revision suggests the cost is now about $18 billion, which S&P estimates to be $27 billion to $28 billion including financing costs. DIY Perovskite Solar Cells: No, Really! And now for the good news. For those of you new to the topic, perovskite refers to a class of synthetic material that mimics the properties of the naturally occurring mineral perovskite. Researchers at NREL and elsewhere have become obsessed with exploiting the solar conversion properties of perovskites because they are incredibly cheap, and they can be formulated as an ink that can be literally painted onto a surface. On the down side, synthetic perovskites are not weather-resistant, so perovskite solar cells need to be designed with a durability workaround. In the meantime, NREL’s latest pitch for perovskite solar cells leans heavily on the idea that practically anybody can apply a layer of perovskite solar material to a surface. David Moore wields a cheap paintbrush, the kind you’d buy at a hobby shop for less than a buck. With a steady, purple-gloved hand, he paints a yellowish liquid onto a specially prepared piece of glass about the size of a half-dollar. And as simple as that, a perovskite solar cell is born. No, really. That’s literally the first paragraph of a rather long article. Menezes did replicate Moore’s success, his solar cell generating about 100 millivolts. 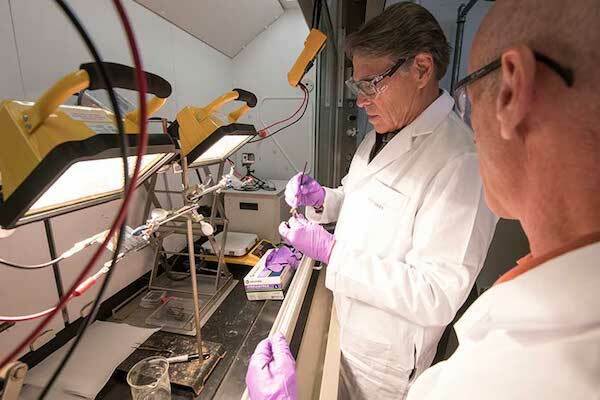 Improvements to the process since then have brought that number up to 650 millivolts, which is the neighborhood in which Secretary of Energy Rick Perry found his own solar cell when he got the chance to try his hand at painting perovskites during a visit to NREL in mid-August. Take a look at the photo that heads this article and you’ll see that really is Secretary Perry applying some artistry to a perovskite solar cell last summer. CleanTechnica is reaching out to NREL to get more details on the latest perovskite research so stay tuned for more on that. To be clear, the US Department of Energy is nowhere near losing interest in supporting new nuclear technology. The agency has deep roots in the World War II-era Atomic Energy Commission and it continues to manage the nation’s nuclear weapons stockpile. Politically speaking, though, the Vogtle project has become such a hot potato that it’s hard to conceive of any further private-sector interest in building another new nuclear facility on that scale, at least not in the US (elsewhere around the world it’s a different story). Nevertheless, at least one company — Bill Gates’s TerraPower — is soldiering on, with an assist from the Energy Department. We’re guessing that they’re working with an eye on exporting the technology rather than building new nuclear facilities in the US, but that’s just a wild guess. Though TerraPower’s technology has been associated with the trend toward small, modular nuclear reactors, apparently the company is more interested in Vogtle-scale projects. As for Vogtle, it is currently the only commercial reactor under construction in the US and it doesn’t look like it will share the newbie spotlight anytime soon, Gates or no Gates. As of this writing, the plant’s two units won’t both be online until November 2022, with a total of 2,430 hard-won megawatts of zero emission electricity. In the meantime, aside from emerging tech like perovskite solar cells, another zero emission boom is emerging along the US east coast, where coastal states like Georgia can take advantage of the rich offshore wind market — and electricity cost savings, too. The technical offshore wind potential of the US is about 2,000 gigawatts — yes, that’s gigawatts — so you do the math. The US has gotten off to a slow start in offshore wind during the Obama administration as certain coastal states (you know who you are) pushed back against federal policies designed to encourage offshore development. In a weird twist of irony, the offshore wind industry has been accelerating at hyperspeed under President* Trump, so go figure. Photo via National Renewable Energy Laboratory.